USA Today is shutting down its weekend magazine at the end of this month, the newspaper’s president and publisher Larry Kramer said in a memo to staffers today. "After careful consideration, we have decided to close USA Weekend Magazine," he wrote. "The December 28 issue … will be its last." 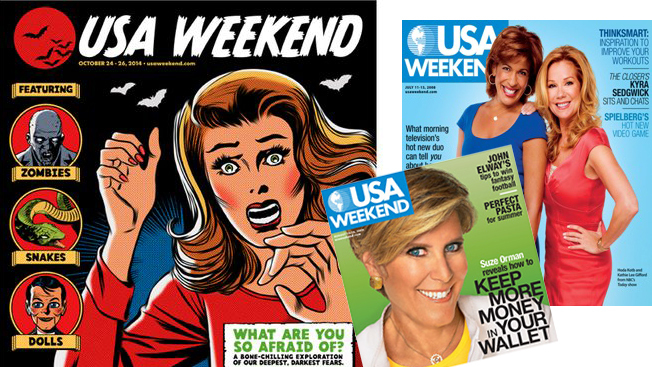 Last year, USA Today began distributing a weekend "Life" publication, focusing on entertainment and lifestyle content, to Gannett-owned local newspapers. After conducting reader research, said Kramer, the company decided that the new supplement provided "readers and affiliates with a superior product to USA Weekend Magazine." The closure of the magazine will result in the layoffs of about 30 staffers, media blogger Alan Mutter reported. Via a source, Mutter said that advertising sales at the magazine had collapsed by nearly half in the last few years, and that "Weekend was expected to produce about $40 million in revenue in 2014, yielding losses in excess of $10 million in each of the last two years." One source identified as "an executive who tried to turn around the decline at USA Weekend" told Mutter, "The cost structure got crazy. You could afford to pay people to take the magazine if you had enough advertising, but this doesn’t work if you don’t." In August Gannett unveiled plans to spin off its publishing division—which hadn’t experienced YOY revenue growth since 2006—from its broadcasting and digital business. Several weeks later, the company laid off about 70 people, including longtime music critic Edna Gundersen and film critic Scott Bowles, who had been with the paper for 30 years and 17 years, respectively.